Notes for Gravitation chapter of class 11 physics. Dronstudy provides free comprehensive chapterwise class 11 physics notes with proper images & diagram. where m1 and m2 are masses of the interacting particles, r = distance between them. The proportionality constant G is defined as the universal gravitational constant and its value is G = 6.6732*10-11 N m2/kg2. Forces of gravity are directed along the line joining the interacting particles and are, therefore, called central forces, which is conservative. (a) bodies of an arbitrary shape whose dimensions are only a small fraction of the distance between the centers of mass of the bodies. (b) bodies having a spherically symmetrical distribution of their mass. The gravitational force is a real force and it is always of attractive nature. Three particles each of mass m are placed at the three corners of an equilateral triangle of side a. Find the force exerted by this system on another particle of mass m placed at (a) the centre of the triangle and (b) mid point of a side. To solve the above problem we apply the gravitational interaction which follow the principle of superposition. (a) When another mass m is placed at O, it experiences three forces , and . Since AO, BO and CO are equal hence . 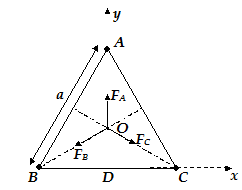 Angle between any two forces is same i.e. 120o. Therefore the resultant force exerted by the system on particle at O is zero. (b)In this case the particle is placed at point D, which is equidistant from B and C.
But they are opposite in direction. Therefore the effective force at D will be due to mass m at A. By geometry of the figure AO=a sin 60 = . This acceleration is called acceleration due to gravity. Its magnitude g is independent of the mass, size, shape and composition of the body. It is directed radially inward to the centre of the earth. (i) ‘g’ above the earth surface at height h (h<< R). From the geoide shape of earth we know that it is bulging at the equator and flattened at the poles. Hence g is maximum at pole and minimum at the equators. What is the acceleration due to gravity of earth at the surface of moon if the distance between earth and moon is 3.8 105 km and radius of earth is 6.4 103 km? (i) If M and R be the mass and radius of the earth then the acceleration due to gravity due to earth on the surface of earth i.e. Similarly, acceleration due to gravity at a distance r (>R) of the earth i.e. The region around a body within which its gravitational force of attraction is perceptible is called its gravitational field. The intensity of the field at a point is defined as the force experienced by a unit mass when placed at that point in the given field due to mass M.
i.e. ; where is a unit vector directed from mass m to that point. 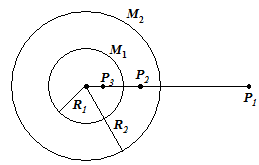 (i) From the figure, it is clear that the point P1 lies outside to both the shell. Therefore, gravitational Intensity at . (ii) When R1 < r2 < R2, the point P2 lies outside the smaller shell but inside the larger shell. Therefore, Intensity at P2 = Intensity due to smaller shell + Intensity due to larger shell. It is defined as negative of work done by gravitational force per unit mass in shifting a unit test mass from infinity to the given point. i.e. is the gravitational potential at a point which is at a distance r from M.
The gravitational potential energy of a particle placed in a gravitational field is measured by the amount of work done in displacing the particle from a reference position to its present position. Generally, the reference position is chosen at infinity from the attracting mass where the potential energy of the particle is taken as zero. This gives the gravitational potential energy of the particle at the point. The negative sign indicates that the potential energy decreases from zero as the particle is brought (from infinity) towards the attracting mass. At surface it is –mgR; R = radius of the earth. The gravitational self energy of a body (or a system of particles) is defined as the work done in assembling the body (or system of particles) from infinitesimal elements that are initially at infinite distance apart. Calculate the self gravitational potential energy of matter forming (a) a thin uniform shell of mass m and radius R and (b) a uniform sphere of mass m and radius R.
Here it is supposed that initially the particles of the body are scattered at infinite distance from each other. Therefore in the formation of a body some external agent has to do some work in assembling the body. This energy is stored in the body as gravitational potential energy and is known as self-gravitational energy or mutual gravitational interaction. (iii)The Harmonic Law – The square of the period of revolution of the planet around the sun is proportional to the cube of the semi-major axis of the elliptical orbit. or T2 = ka3 where k is a constant and same for all planets. A planet moves around sun in an elliptical orbit of semi-major axis a and eccentricity e. If the mass of sun is M, find the velocity at the perigee and apogee. Let m be the mass of the planet. Let m be the mass of the planet or satellite which revolves round the sun/planet of mass M in a orbit of radius r from the centre of the Sun/Planet with velocity vo. The required centripetal force is provided by the gravitational attraction between Sun and planet (or planet and satellite) i.e. 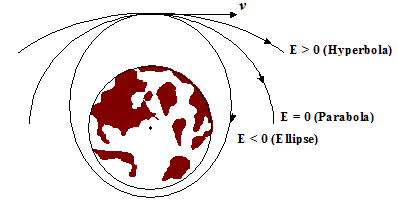 Energy of a satellite around a planet is of two types (i) P.E. and (ii) K.E. Velocity of satellite and nature of path. (i) V = Vo ® circular path around the planet. (ii) V < Vo ® Elliptical path return to the planet. (iii) V > Vo ® Elliptical path around the planet. (iv) V < Ve ® Elliptical path around the planet. (vi) V > Ve ® Hyperbolic path escape from the planet. 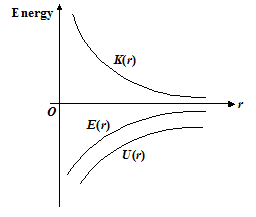 The variations of kinetic energy K have been shown by the graph as shown, potential energy U and total energy E with radius for a satellite in a circular orbit. From following graph it is clear that the value of U and E are negative and that of K is positive. As the r increases three curves have the tendency to approach the value of zero. It is defined as the minimum velocity needed for a particle projected upward so as to escape from the planet. From (1) it is clear that the amount of work required to move the particle from the surface of planet to infinity would be .If this energy is converted into kinetic energy by any means then the corresponding acquired velocity by the particle will be the escape velocity (ve) i.e. According to the problem sky lab exists in three energy levels, our task is to calculate the total energy of the three level. i.e. on the surface, first orbit and second orbit. Energy difference between first orbit and surface of the earth is the answer of (a) and that between first orbit and second orbit is the answer of (b). Total mechanical energy of the sky lab in first orbit i.e. Total mechanical energy of the skylab in the second orbit i.e.